What's all this tidal-power bean-counting apathy about – anyhow? What’s all this tidal-power bean-counting apathy about – anyhow? Without electricity you wouldn’t be reading this article. Your device would be dead and the article couldn’t have been written electronically and then Internet-posted. For us humans electricity is a primary life-sustaining element. Not surprising then that generating electricity is a big money business and we need to create a lot more of the stuff by 2050; about 60% more than we do now. Right now the world currently uses about 18TWh (TeraWatt per hour) annually and to put that into perspective one TWh is equivalent to using 5 billion barrels of oil per year or 1 billion tons of coal per year. Not surprising then that governments and companies around the world are starting to see the investment opportunities in the electricity generation game. Or are they? Finding the right amount of financial investment to make a project viable is not that straight forward as demonstrated recently by Japanese conglomerate Hitachi when it announced it was pulling out of the nuclear plant project at Wylfa in Wales. One of its reasons is the difficulty of finding additional investors to pitch in with some cash to co-fund the project. And don’t expect our Government to come galloping to the financial rescue. Its reluctant to commit more money to the project as of course it will come out of taxpayers’ wallets and that’s not necessarily a vote winner because of the worries that a cross section of the electorate have about nuclear generated power. With that in mind, totally clean and environmentally friendly renewable ways of generating electricity always tend to calm the fetid brows of the nuclear anxious and also keep the tree-huggers happy. And this is where a newcomer on the electricity-generating block comes in called tidal lagoons, a form of tidal wave power. Tidal power has massive potential. Whereas solar and wind generated electricity is subject to vagaries of the weather our ocean movements are utterly reliable thanks to the moons influence. The huge quantities of Earth’s large bodies of water are pulled by the gravitational field of the moon as it rotates around the planet. Tidal energy is harvested from the rising and falling water through a variety of methods including in-stream devices, barrages, tidal pools and dynamic tidal power, all of which work by driving a turbine. Of the various ways of harvesting tidal energy it looks like tidal lagoons are the most promising. Environmentally, Friends of The Earth like them because for every ton of material used in the creation of a tidal lagoon three times as much energy is created compared to using a ton of coal. They are also much safer for indigenous sea life. They are also more efficient than tidal barrage systems. 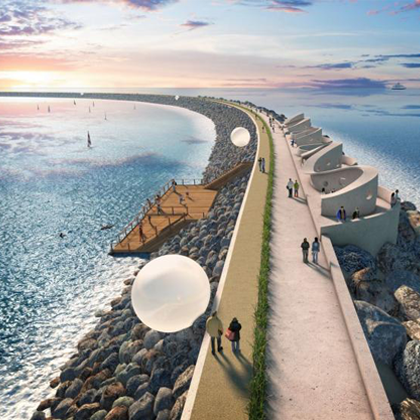 A particularly interesting tidal lagoon project is the one being pioneered in Swansea, Wales. Called the Swansea Bay Tidal Lagoon this would be a 320MW power generating facility that would operate 14 hours daily and have an expected lifetime operation of 120 years. It could provide 11% of the electricity required for the whole of Wales. Fundamentally they are huge sea walls that create an off- shore lagoon which captures vast amounts of water. Gates hold back the water from the turbines and when sufficient levels have been reached the water is released. The very considerably force of this water drives the turbines. This trapping and subsequent release of water happens during both incoming and outgoing tides. So whereas King Canute, back in the 11th century, famously failed to hold back the waves of an incoming tide it now looks possible by building tidal lagoons. Sadly however the UK Government has decided not to back the project financially and it looks like private funding by commercial investors may possibly be the way forward. So why is the Government reticence about spending the money on the Swansea Bay Tidal Lagoon even though it is a thoroughly clean, sustainable, efficient, reliable and environmentally responsible source of electrical power? The problem is the bean counters don’t like the cost, particularly when it’s compared to the cost of electricity that is produced by nuclear power. Broadly speaking it works out at twice the cost. However, in direct contrast to its resistance to tidal lagoons, the Government is happy to build six new and very expensive nuclear power stations throughout the UK. But what this ambitious plan has recently demonstrated is how fragile and mercurial financial structures can be when it comes to pricey energy projects. Japanese conglomerate Hitachi dealt the Wylfa nuclear power plant project a very heavy blow when for financial reasons it decided to withdraw its investment. Add to that the fact that Toshiba also withdrew its plans to financially support a nuclear power station in Cumbria and it looks like the power stations planned by the Government have been unceremoniously kicked into touch. What this clearly shows is that given the high cost of constructing nuclear power plants (estimates range from £20 -£50 billion) there is a real reluctance by private investors to pitch in. And lets not forget that the estimated cost of building the Swansea Bay Tidal Lagoon is put at £1.3 billion which looks a bit of a bargain compared to the nuclear projects. Add to that the environmentally arguments against nuclear power and it’s a possibility that electricity generation via tidal lagoons will find the private backing it needs, but it wont be easy. Cost of the electricity produced is the overwhelming challenge for tidal lagoons, especially when you consider that it comes in at around eight times more expensive than solar or wind power. Also, experts are saying that it could still be up to 50 years before renewable energies become the major source of power. But technologies are being developed that will see an increase in how efficiently tidal power produces electricity. Water turbines will always vary in their speed of operation depending on the load being applied to them which in this case is the flow of water into and out of the tidal lagoon. This can of course effect the amount and voltage being generated but fortunately solid state controllers are being developed that can sense and regulate such power fluctuation. Also improving efficiencies are the development of better axial and cross flow turbines which may mean that the power generating capabilities of tidal lagoons will in the long term become more financially attractive. So tidal power might just be one of the alternative long-term solutions to satisfying the world’s ever increasing hunger for electricity and to satisfy that demand in an ecologically friendly way. And perhaps politicians should take note of the words long-term particularly as tidal lagoons would have a working life of 120 years whereas expensive nuclear power plants are only good for about 50 years.